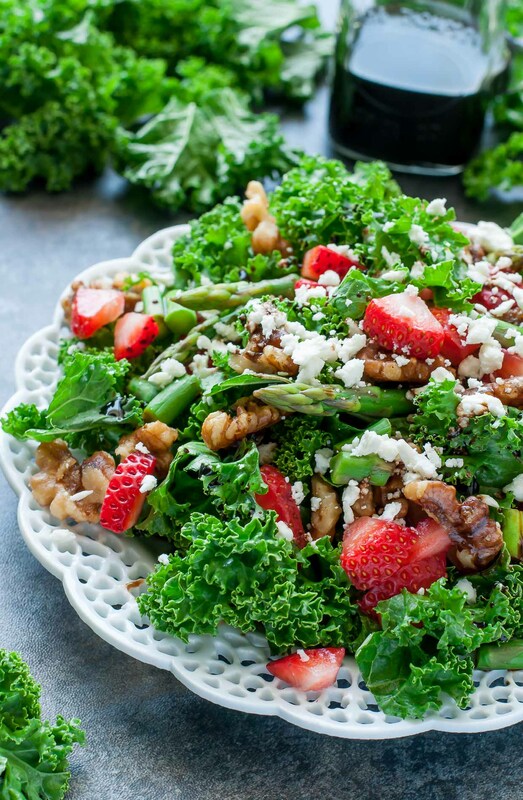 This lean, green, strawberry kale salad is just what you need to beat the heat this summer. Quick, easy, and downright delicious, this superfood salad is loaded with nutrients! Mornin’ darlings! I’ll cut right to the chase: today we’re gonna eat kale. Normally I’d be a bit self conscious about my gratuitous use of kale in this salad and tell you to feel free to substitute it for spinach or romaine as needed, but I’m not going to do that today. Leave the iceberg, take the kale. Today we’re eating our kale and loving it too! Seriously! I know, I know. Kale has a bad SUCH a bad rap. I, however, think it’s marvelous. It’s all in the prep work! Gentle massaging with a teeny bit of olive oil and a pinch of salt transforms this once-intimidating roughage into a silky, tender, and overall fabulous salad green. I can prep a head of kale quickly over the weekend and know that I’ll have a big ole bag full to add to my salads all week long. It outlasts all other lettuce. Where iceberg, romaine, and even my beloved spinach will wilt and/or brown, kale has my back. Not only do these gorgeous greens have staying power, it also is the ideal salad base for my lunches. It gently cradles your favorite dressings instead of soaking them up and going soggy and gosh darn it, I’m going to have to insist you try it. We’re loving this veggie salad with a boatload of fresh seasonal berries. Looking for a few dressing options? You can try it with a basic balsamic vinegar (I love using strawberry infused ones) or try my DIY homemade balsamic dressing recipe in the recipe card below. Want to jazz things up even more? Give my Balsamic Blueberry Salad Dressing a go! I flipping LOVE this salad! Strawberry salads are uber popular here in the South but this one is hands-down my favorite. Lightly sweet and chock full of nutrients… it’ll be on repeat around here all Spring and Summer long. 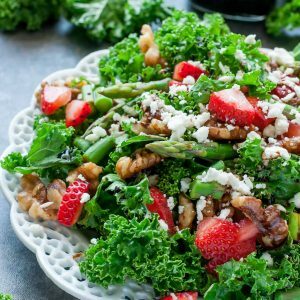 There’s something magical about the combination of juicy ripe strawberries with sweet, crunchy, candied walnuts, creamy feta, and HOW ABOUT THAT KALE!? 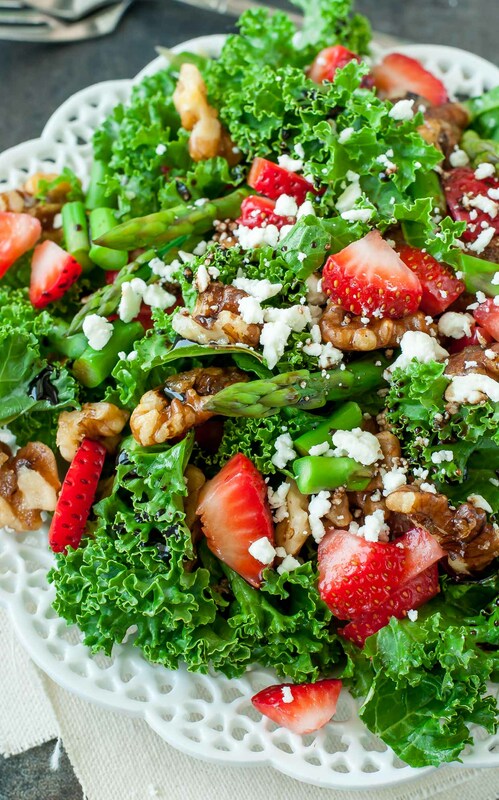 Strawberry kale salad for president! Finish it off with a pinch of salt and combine with strawberries, candied walnuts, and asparagus. For the dressing, add all ingredients to a mason jar and shake well. Drizzle as desired over your salad. Leftover dressing can be kept tightly sealed in the fridge for several days. Recipe yields 2 side salads or one jumbo salad! The above measurements will get ya started, but feel free to add extra fruit, veggies, nuts or cheese if you'd like! This salad will easily feed one, two, or even a crowd! Have fun with it! After thinking about Alexis’s gorgeous Strawberry Coconut Kale Salad non-stop, I decided to put my own spin on the yummy combo. Obvi you need to make both! Worried about the lonely leftover kale from the bunch? Fret not! You can make this salad multiple times (it’s that good!) or try a few new kale salad combos! I always massage the entire bunch of kale and keep it in a baggie in the fridge for quick and easy salads all week long. I also love stirring it into pasta (this recipe rocks!) and crisping it into chips. Totally a token food blogger thing to do but they’re so gosh darn addictive that I embrace the stereotype with open arms. 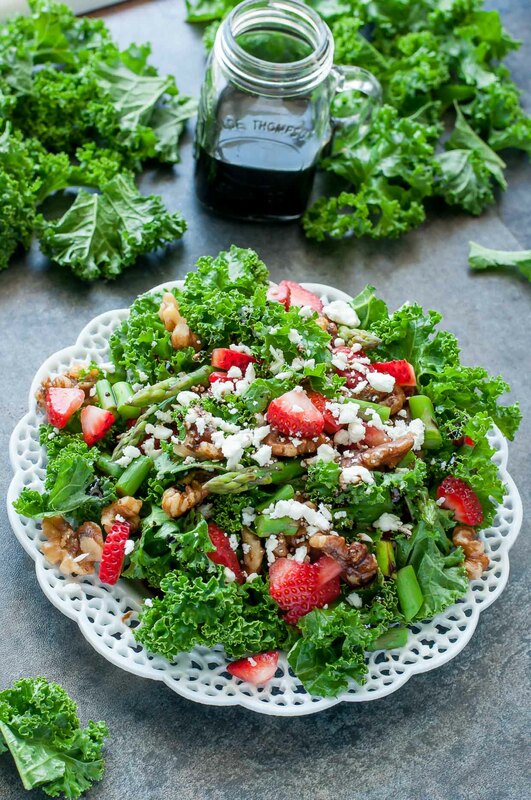 If you get a chance to try this sassy strawberry kale salad, let me know! Leave some love in the comment form below or tag your photos with @peasandcrayons on Instagram so I can happy dance over your creation! I can’t wait to see what you whip up! I do love kale but we mainly get the Russian variety in our CSA, the broad flat leaves with the purple tips. I typically just drink them down. I’ll be looking for some of it’s perkier sister though so I can make this. I’ve never added strawberries to a salad before.. so thanks for the idea! I make this salad almost daily for my lunch when Strawberries are in season it’s so fresh and yummy! Yum!! We did a strawberry and feta salad last night but I just used regular old mixed greens. Next time, I’m trying it with my beloved kale! You had me at strawberries and feta. Massaged kale salads have been 100%, a much better experience for me! I love how every piece of strawberry and cheese looks perfectly placed on your plate. I have to 100% concur that I LOVE kale especially because it doesn’t get soggy like other salad with dressing on it. This looks AMAZINGLY delicious, it’s nice & healthy, perfect for summer, and the colors are so pretty! I love all of your pictures! 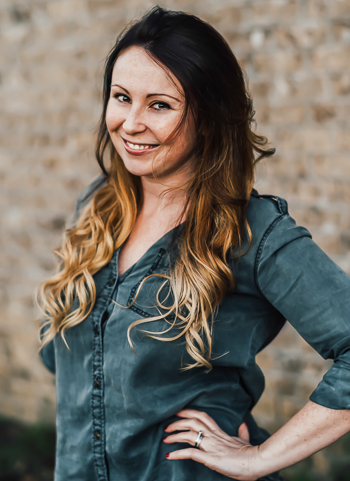 (Do you shoot in raw format? )- I have to start doing that! LOVE the strawberry and kale combo! I usually make mine with kale, strawberries, avocados, red onion, walnuts and balsamic. Sometimes I add goat cheese and it’s amazing! This looks so pretty and delicious! Love that it has asparagus spears too 🙂 Pinning this awesomeness for later! Thanks Josie!! <3 Hope you adore it! I hope Meg sees that asparagus sticking out. She’ll go gaga for it. Not a huge kale fan but if you promise after some massaging and poking it turns out baller, I’m game. this ingredient combo and the rubdown make it deeeeeeeelish! I keep saying that I’m going to make a kale salad soon but then I get scared. I think this has enough stuff in it to keep me interested though! Dooooooooo it! Don’t be scared girlfriend! Us milwives can tackle anything! Plus it’s super yummy with these ingredients =) mwah! Oh yum! I love kale and don’t understand why it gets a bad rap. I just got back from a week of eating crap on vacation, so a big ol’ salad like this sounds SO good to me right now.